Are you looking for that special piece of furniture or unique home decoration that will serve you for years to come? You are at the right place! 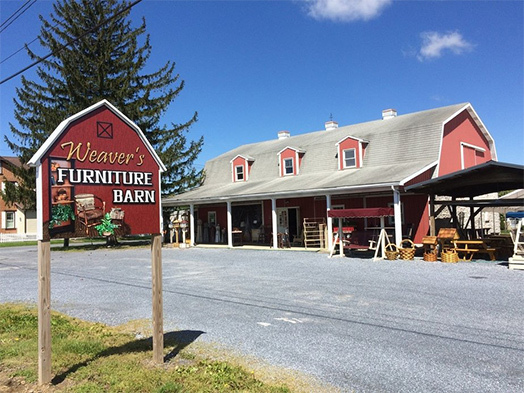 Weaver’s Furniture Barn - Your go-to place for the finest selection of indoor and outdoor furniture, crafts, handmade toys, and custom-made furniture. We serve the Lebanon, Myerstown, Schaefferstown, Palmyra, Hershey, Reading, Harrisburg, and Lancaster, Pennsylvania areas. Why should you come see our store? We stock a wide selection of quality handmade furniture in our store. We have catalogs from all our suppliers in our “catalog corner” that you are free to browse. Friendly, on-site staff will answer your questions and help you decide which piece will best meet your needs. Examine the wide range of stains and finishes we offer to get a good idea of what you need for your decor. Can’t find it in our catalogs? Our on-site craftsmen take special orders for custom-designed or custom-finished furniture. Our specialty is to give you the personal attention you need to help you make the selection that will satisfy your dreams. Weaver’s Furniture Barn brings you the finest in craftsmanship. We sell hardwood or pine furniture. (Unfinished is optional.) Walk through our store and browse our catalogs. You will see that quality is in the details. Here is what you can expect to find. Variety for every room of the house! Dining room tables and chairs, beds and chest of drawers, entertainment centers, porch rockers and more. Come check out our floor displays. Bedroom furniture – bedframes, armoires, chests of drawers, dressers with mirrors, nightstands, etc. Dining room furniture – table and chair sets, hutch cabinets, corner cabinets, etc. We offer a complete line of wooden and handmade toys. You will find anything from old-fashioned rocking horses to barns with wooden animals to marble rollers. We offer doll furniture and accessories, kitchen play sets, wooden trucks, and more! Along with the toys we sell a complete line of child’s furniture from rocking chairs to the unique three-in-one which functions as a high chair, rocker, or desk chair for your child. Most of these are made from genuine Northeast hardwoods so you can count on quality and durability for a lifetime.